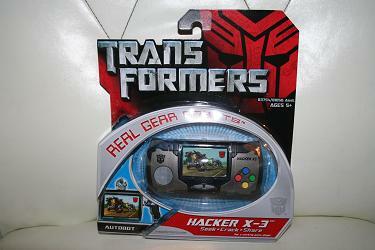 Continuing on the loose-end journey that is vital for any long running, some would say too-long-running, series, we turn our attention back to the Real Gear products from the 2007-2008 Transformers movie line. We have yet to add the 5th wave of these figures to the Preserve, and the 6th wave of figures has never even made it to this town! It seems that they aren't really popular enough for them to leave the Hasbro warehouse, either that or they still haven't hit wide distribution - either way the Preserve is still missing the last part of this sub-series, and may have to visit the ol' online Hasbro storeplace to fix that. Either way, feast your eyes on yet another repaint, Hacker X-3! I find that I have a soft spot for these guys, and enjoy that another Autobot has been added to the ranks, as a repaint of the Decepticon Power Up VT6 no less! Sounding like a good Robin Hood type of hacker from his bio (and, well, from his name) it's hard not to like the aims of this character, and maybe we'll even see the growing ranks of the Real Gear characters used elsewhere in the continuity eventually!